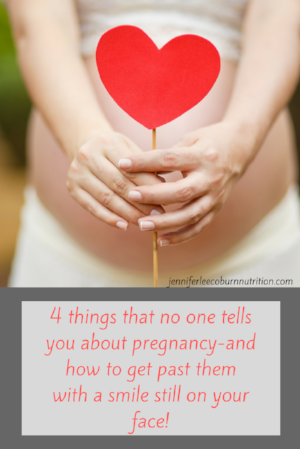 4 things that no one tells you about pregnancy-and how to get past them with a smile still on your face! You’re pregnant! YAYYYY! Most exciting news you will ever hear! And then reality hits….no one tells you how pregnancy affects your body and your mind. It is the most wonderful feeling in the world, and sometimes, the worst…..I used to work at a WIC office long, long time ago, and I got these questions often. “What can I do about all of these WONDERFUL side effects of pregnancy?”! Why do we get morning sickness? It’s so annoying. And everyone has different levels of it. Some people go throughout their entire pregnancy with none, while others have a touch of it here and there, and there are others who, unfortunately, have it the entire time they are pregnant. I always tell my pregnant patients that there are a few things you can do curb the side effects of morning sickness. keep something small by your bed. Lots of people feel better if they get something on their stomach before hitting the floor in the morning. eat small frequent meals throughout the day. Lots of women get nauseous when they have nothing on their stomach, and eating a little bit all day long can help prevent that. avoid fatty foods, fried foods, spicy foods, and greasy foods. And, any other food that may trigger your stomach to start churning. Unfortunately, constipation is a side effect that is just a bummer (pardon the punJ). Lots of times you don’t even realize you are constipated until you are already experiencing symptoms like stomach cramps and ughhh hemorrhoids (that could be a whole DIFFERENT) post. To try and prevent constipation, these are my thouhts. Eat foods that are high in fiber. This includes fruits and vegetables especially with the skin, whole grain cereals, brown rice, and beans. Drink plenty of water. Try to drink 10 – 8oz cups of water a day. Fluids help to keep you hydrated and help to make bowel movements easier. If all else fails, sometimes medication is needed, but I always say to ask your doctor their recommendations for your specific complaints. Try to avoid problematic foods such as high fat foods, fried foods, spicy foods, milk and some dairy products. Some foods that help the diarrhea and its symptoms to subside are applesauce, bananas, rice and oatmeal because they help absorb excess water that is passed with diarrhea. Eat less, more often….sometimes I say 6 mini meals/day but that is not possible for some people. The point is to not overfill your stomach. So, however that works for you, try to eat a little all throughout the day. Eliminate “trigger foods” – common foods that “trigger” your heartburn. Examples are acidic foods, citrus fruits, tomatoes, greasy or fried foods, spicy foods, chocolate, coffee and carbonated beverages. Eat your last meal 3 hours before bed. Elevate your head and don’t lie flat on your back. This will allow your food to fully digest before laying down for the night and it just “sitting” in your stomach, creeping back up….. If all else fails – antacids. I always recommend to check with your doctor when taking any medications, so please be sure and check with your doctor to choose the right medication and the right amount! Pregnancy is a wonderful thing! And women everywhere have different symptoms and different levels of these symptoms. These tips are great ways to get through these symptoms and move on through pregnancy with more good times and less blah!! !